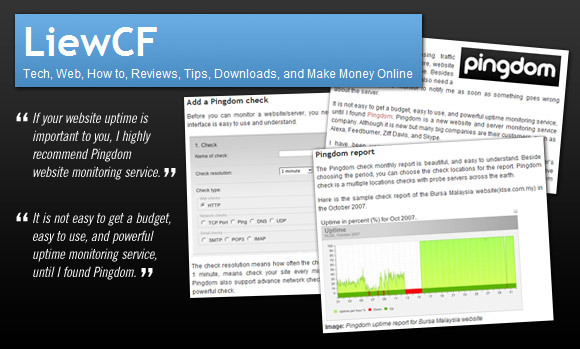 The tech blog LiewCF.com has given Pingdom’s uptime monitoring service a very positive review. If your website uptime is important to you, I highly recommend Pingdom’s website monitoring service. We’re very happy about receiving such a glowing review. You can read the whole thing over at LiewCF.com. Thanks to Liew Chen Fong for taking the time to review Pingdom. He has a very good point regarding the importance of uptime when you are making a living off your blog. Downtime = lost traffic = lost exposure of both your blog and the advertising on it. Downtime can also seriously hurt your rankings in search engines, an important source of traffic for many bloggers. This of course doesn’t just apply to blogging, but it’s a good example.